Tragedy in the Nuba Mountains: hunger and starvation are constants | "Global Possibilities"
Samuel Totten, University of ArkansasEver since the war between the Sudan People’s Liberation Movement-North and the government of Sudan broke out in June 2011, the government has carried out almost daily aerial attacks against civilians living in the Nuba Mountains. When not killed, the people suffer horrific injuries, including sheared limbs and inner organs ground to mush. The liberation movement is demanding self-determination and power-sharing for the Nuba people. The Nuba have lived in the area for thousands of years, and fought with the South during the Second Civil War (1983-2005). But, they were prevented from seceding with the rest of the South from Sudan. When the Nuba people continued to be threatened by Khartoum, they picked up weapons and formed the SPLM-N.
Nuba farms and stores of food are often destroyed by the aerial attacks and people are fearful of working their farms. Hunger lingers. Many are suffering from malnutrition to severe malnutrition and are dying from starvation. 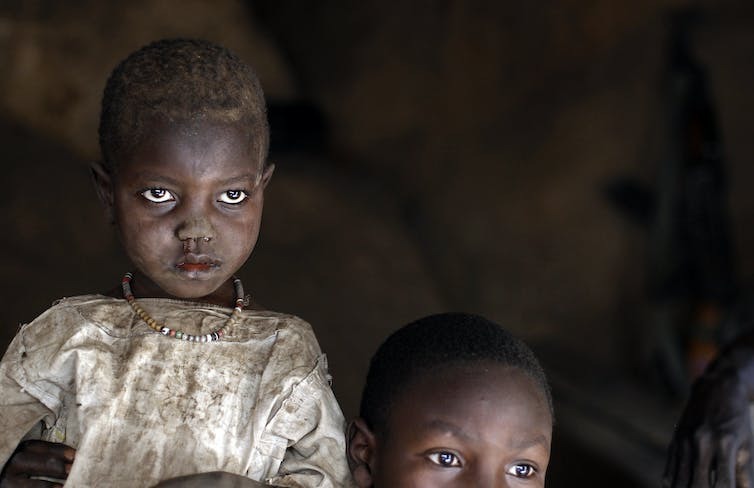 In places like Kao Nyaro, severe malnutrition and starvation have been a constant. Despite the critical need for food, none of the organisations involved in helping people in dire need have attempted to deliver aid to the Nuba. This includes UNHCR, the World Food Program, CARE, Mercy Corps, the International Red Cross and Oxfam. Because of the lack of international assistance, informal channels have picked up the slack. I know of four different groups who have been trucking food up since early 2012. Personally, I have made five trips up to the Nuba Mountains during the period of the war to take in as many tons of food as possible. Most of us travel through the territory controlled by the Sudan People’s Liberation Movement-North. These efforts have resulted in the delivery of hundreds of tons of food and a wide array of medicines and medical devices. All of this has been accomplished by travelling over dusty, rutted roads and in the face of the daily aerial attacks by the Sudanese government. Still, the Nuba continue to suffer from the entire gamut of hunger. Exactly why international organisations and individual states have not stepped up to help the Nuba remains unclear. But various reasons have been floated by those involved in the informal efforts. The main reason could be the international community’s efforts not to irritate Sudanese President Omar al Bashir, as well as fears that the fight against terrorist groups in the region could be compromised. The biggest fear is that al-Bashir could easily decide to return to war if he believes that Sudan is being toyed with by the international community. Under the Comprehensive Peace Agreement, which was signed following the Second Sudanese War, al-Bashir agreed to allow the people of the south to vote in a referendum on independence. People resoundingly voted to secede from Sudan, and to establish the Republic of South Sudan. If the international community, in al-Bashir’s eyes, brazenly enters Sudan without Khartoum’s permission, thus trumping its sovereignty, al-Bashir could do everything in his power to attempt to reclaim the land which was ripped from Sudan. The international community has been wont to accommodate Khartoum on the grounds that it’s not controlled by terrorist organisations such as Al-Qaeda, ISIS, Al-Shabaab. The US government has been engaged in a quid pro quo with Sudan: if Sudan allows the US to operate its war against terrorism on its territory – including small drone bases in the country – Washington will go easy on the country. Former President Barack Obama’s decision to lift some sanctions against Khartoum might constitute evidence of this. Humanitarian groups may assume that they need military escorts to get food to the Nuba Mountains but have not been sure whether the international community would step up to the plate. Air drops aren’t feasible because the Sudanese government controls the skies of South Kordofan and Blue Nile States with Sukhoi supersonic all-weather attack aircraft. Diplomats believe (or want to believe) that six years into the Nuba crisis negotiations would eventually result in a breakthrough. Compassion fatigue has set in given that aid organisations have their hands full dealing with other major crises. Still, the situation remains puzzling. A host of international aid groups are actively providing aid to countless numbers of people in at least a dozen crisis areas that are equally, if not more dangerous. 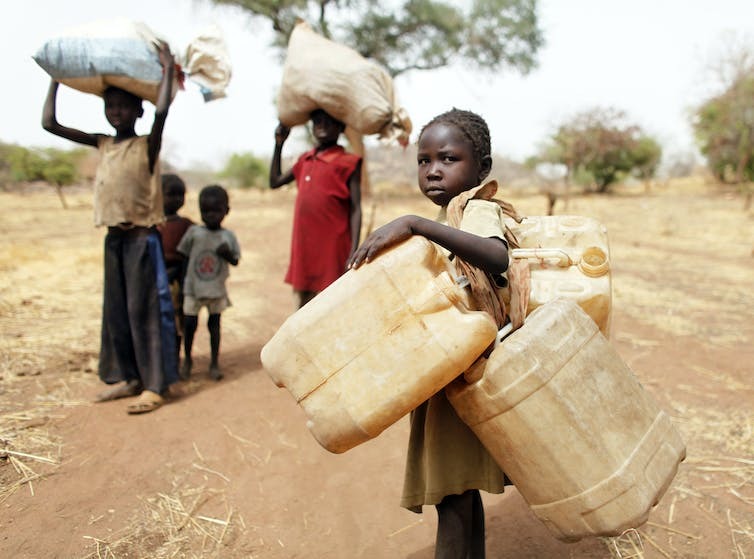 Oxfam and CARE, for example, work in The Republic of South Sudan where a treacherous war rages. The two organisations, together with Mercy Corps and the International Red Cross, are also active in Syria. Four organisations – Oxfam, CARE, Mercy Corps, the International Red Cross – are also active in Afghanistan and the Democratic Republic of the Congo. All, except Oxfam, are also working in Somalia and Yemen. The US has broached the idea to the SPLA and Khartoum about allowing food to be flown from Khartoum to the Nuba Mountains. The Sudan People’s Liberation Movement-North (SPLM-N), however, demands that 20% be delivered through Ethiopia, thus allowing them to control the delivery. The SPLM-N not only fear Khartoum may poison the food, but also said it wants to be sure at least some of the food gets to the region, citing Khartoum’s manipulation of aid deliveries to Darfur, where Khartoum persistently refused access to the region. For now, though, both groups, the SPLM-N and Khartoum, are at a stand-off. For the sake of the health and lives of Nuba civilians, the stand-off needs to be solved sooner than later. Samuel Totten, a scholar of genocide studies, has made five trips to the Nuba Mountains. His latest book is: Sudan’s Nuba Mountains People Under Siege: Accounts by Humanitarians in the Battle Zone. Dozens of supporters of Kenya’s opposition coalition have gathered around the Supreme Court building where lawyers are expected to file a petition contesting President Uhuru Kenyatta’s re-election. The 106 Nigerian schoolgirls no longer in captivity by Boko Haram jihadists fighting against western-style education will all go to university from September, the country’s minister for women’s affairs has said.